"I've tried several textbooks, and the experience revealed the authors' biggest mistake. The biggest mistake was insufficient revisions–a lack of focus on digital, social, and mobile in today’s texts." But there is one exception. Bovee and Thill extensively cover digital, social, and mobile communication throughout their texts. If imitation is the sincerest form of flattery, then Bovee and Thill should be proud, because they’re the most imitated authors in the field. Their texts set the standard by which other textbooks in the field are judged, which is why their texts are the best business communication textbooks available today. Bovee and Thill texts are also frequently used by instructors for management communication instruction, organizational communication instruction, managerial communication instruction, and corporate communication instruction. Course titles include Management Communication, Organizational Communication, Managerial Communication, and Corporate Communication. 1. Three decades of market-leading innovation, with unique content, pedagogy, and instructor support resources. The history of business communication over the past couple of decades has been one of almost constant change. The first major wave was the digital revolution, replacing much of the print communication of the past with email, instant messaging, web content, and other new forms. Then came social media, which fundamentally redefined the relationship between business and their stakeholders. And now comes the third wave, and it's proving to be every bit as disruptive–and full of exciting possibilities–as the first two. Mobile communication, and mobile connectivity in the larger sense, is changing the way business communicators plan, create, and distribute messages. Mobile devices are overtaking PCs as the primary digital communication tool for millions of consumers, employees, and executives; business that don't get mobile friendly in a hurry will fall behind. The fundamental skills of writing, listening, presenting, and so on will always be essential, of course, but those skills must be executed in a contemporary business context. That's why Bovee and Thill textbooks carefully blend technology awareness and skills with basic communication skills and practices. 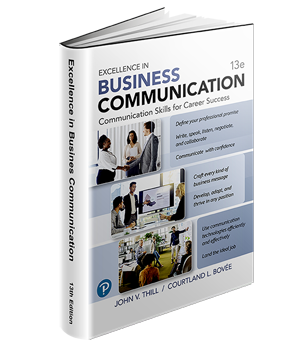 Discover for yourself why Bovee and Thill textbooks are considered the best business communication textbooks on the market. As you consider the best business communication textbooks, keep in mind he Importance of mobile communication coverage in the textbook you select. Mobile has become the primary communication tool for many business professionals, including a majority of executives under age 40. Email and web browsing rank first and second. In terms of the most common non-voice uses of smartphones, more email messages are now opened on mobile devices than on PCs. Roughly half of U.S. consumers use a mobile device exclusively for their online search needs, and many online activities that eventually migrate to a PC screen start out on a mobile screen. For many people, the fact that a smartphone can make phone calls is practically a secondary consideration; data traffic from mobile devices far outstrips voice traffic. Looking for useful teaching materials for your course in business communication? We suggest you check out these websites: Google+, Reddit, YouTube, LinkedIn, Facebook, and Twitter. 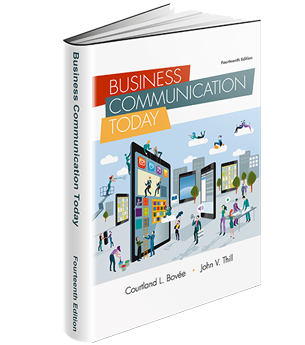 As you select the best business communication textbook for your students, remember that only Bovee and Thill covers mobile communication. All other authors are pretending that mobile doesn't exist. Would you like to read more about this topic. Refer this video to your friends. Courtland Bovee says, “We offer a clear, consistent, and integrated approach to teaching writing using the three­-step process.” The three-­step process is uniformly applied throughout each book and is adapted to each message form. 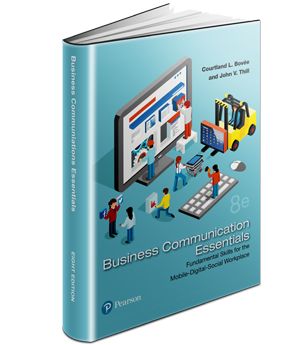 Read the full article from NBC Right Now so that you can choose the best business communication textbooks to consider for adoption.